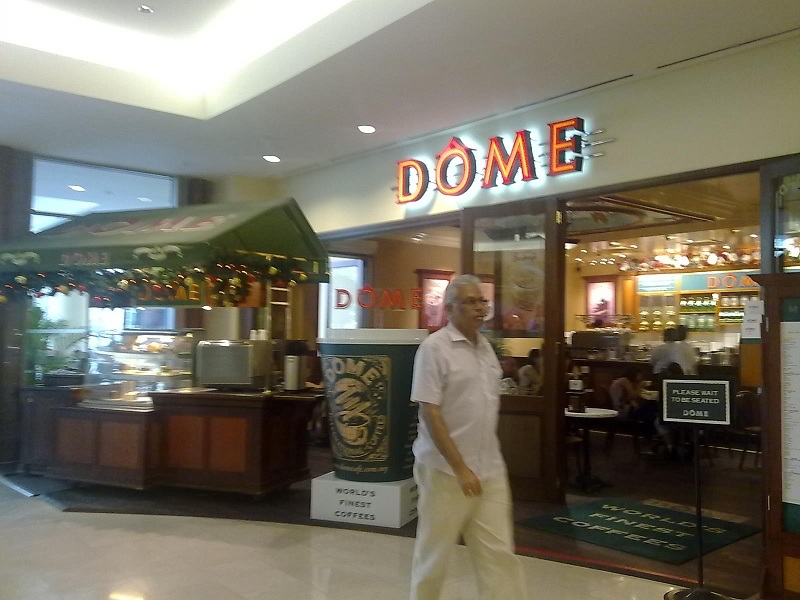 Today I went to The Gardens Mall for Dome Cafe because they are giving away free voucher! 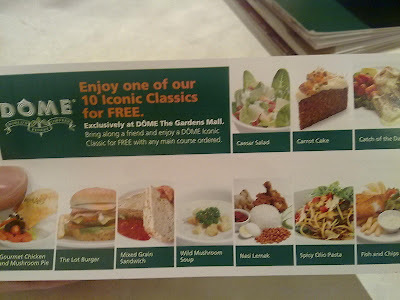 The slogan is "Enjoy One of our 10 Iconic Classics for FREE", printed on the voucher together with small 10 photos of iconic classics. Dome Cafe Malaysia has promoted this on their Facebook account and try to attract more people going there in conjunction with the opening of DOME cafe @ The Gardens Mall. so, if you have Facebook account, please immediately "LIKE" Dome Cafe Malaysia Facebook account, then great thing will come to you. Well, you can instantly get their latest update on promotion in Facebook anyway. In Conjunction with the opening of DOME Cafe @ The Gardens Mall. We're offering a lil' something for our Facebook Friends. Get this VOUCHER from DOME Cafe - The Gardens Mall this Weekend when you present our password "FACEBOOK" to receive this voucher. Just walk in during the date & time below - present the password. *Limited to 100 Vouchers per session, per day. **Limited to 1 Voucher per person, per day. ***Enjoy one of our 10 Iconic Classics for FREE, exclusively at DOME The Gardens Mall. Bring along a friend and enjoy a DOME Iconic Classic for FREE with any main course ordered. T&C of the Voucher applies. Even though you don't wanna dine in this weekend, but the voucher is actually expired on 31st of December in 2010. Just go there and give them the password & voucher will be in your hand next second! I had dined in with my best friend & my partner just now for early dinner. They had the same, Catch of the Day & I had Nasi Lemak. 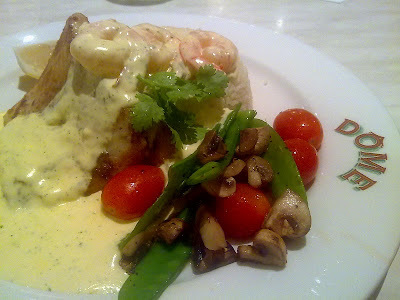 Dome cafe @ The Gardens Mall is very generous in food portion, compared to KLCC's Dome outlet. 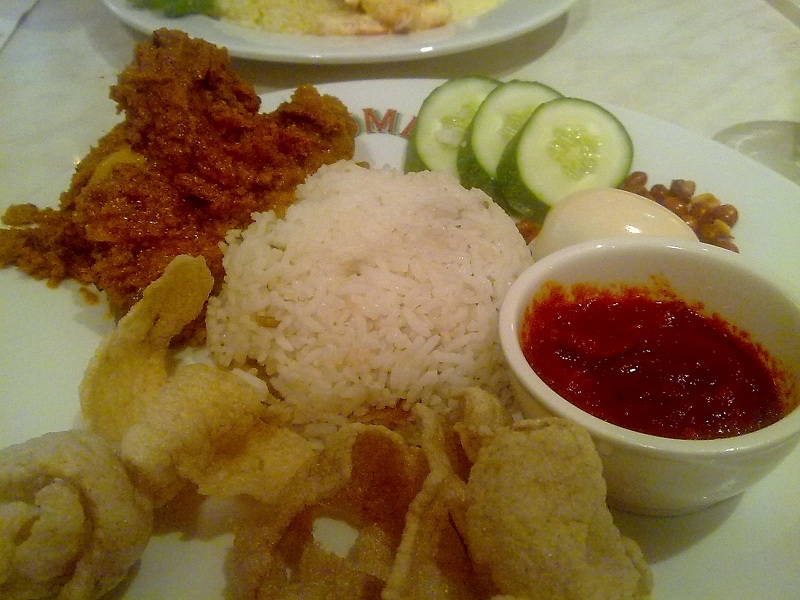 Presentation of the food is absolutely pretty, unlike KLCC's Dome outlet. 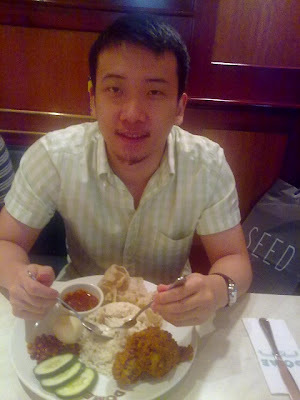 Very friendly waiter & waitress, much much better than KLCC's Dome outlet. 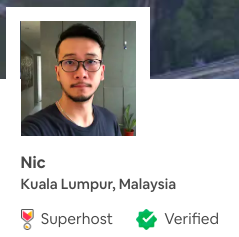 Hehe...sounds like I'm giving KLCC's Dome outlet a bad review then. Probably this outlet is still new, we will have to see after few months. Keep up the good work, Dome cafe @ The Gardens Mall. I have 4 more vouchers to use till 31st December 2010. Hehe. Don't ask me why. So Dome cafe @ The Gardens Mall, please keep an eye on me. Because I (My partner mostly) am very fussy in everything.